We're just a couple months into 2016 but the years big food trend seems to have been established. We've already seen a handful of Southeast Asian spots open and more are coming. I didn't want this mom and pop spot on Chicago avenue in Ukrainian Village to be left out so I'm giving it's LTH introduction. 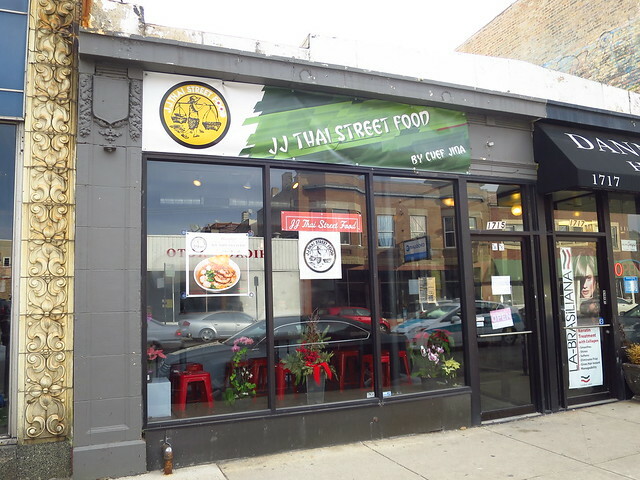 JJ Thai Street Food sits in the old Yuzu space. Its name is a salute to the Jatujak Market in Bangkok, sometimes called JJ Market. The owner, Chef Jina, is a former cook at Yuzu who used to make her family recipe Thai meals for the staff over there. When Yuzu decided to move down the block the people behind it convinced Chef Jina she needed to open her own place and the old Yuzu location was the perfect spot to do so. So far, so good. All the cooking is done in an open air kitchen which gives the slight feel of eating at a shophouse or food stall. On each of my visits in there were big pots simmering away while making the restaurant smell like a busy food block in Bangkok. The menu is a collection of her favorite recipes some of which aren't all that common around town. 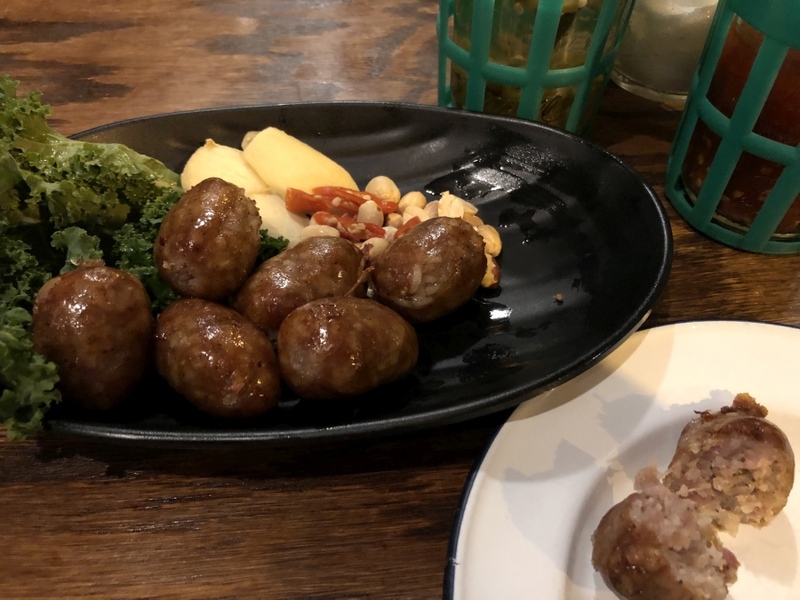 Though due to the recent influx of Thai spots opening up, as well as the regulars, stuff like Isaan sausage is becoming much easier to find. I thought JJ's version was missing a tad bit of snap though so are most others around town. But the flavors were right there. Unfortunately there are no fish options under the salads, those being my favorite, however the grilled pork salad is another dish I was really happy with. Nice hints of fish sauce mixed with tender slices of pork and plenty of fresh red onion slices with snap. It's rec'd you accompany it with a nice bowl of sticky rice on the side. 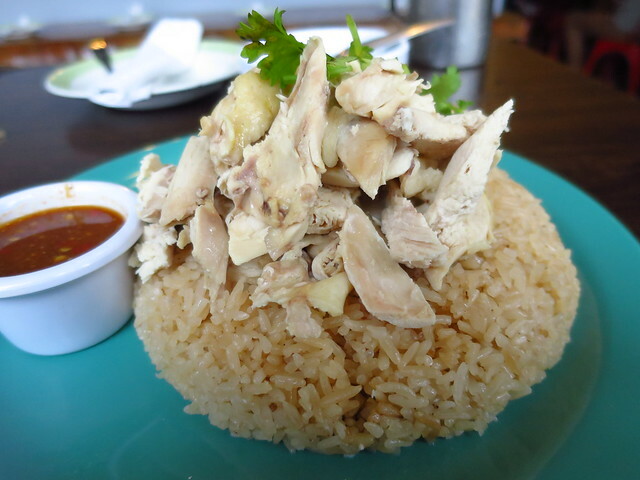 Khao Man Gai is a dish popping up regularly at these newly opened Thai spots. It's basically Thailand's take on the popular Chinese dish Hainanese Chicken. It's poached chicken served atop rice. Usually there's a potent cup of broth on the side but I didn't get one at JJ. The chicken was still pretty good but poached chicken can only go so far. Luckily the ginger rice and spicy dipping sauce on the side were there because they only enhanced it. My favorite item thus far is the Khao Kha Moo. 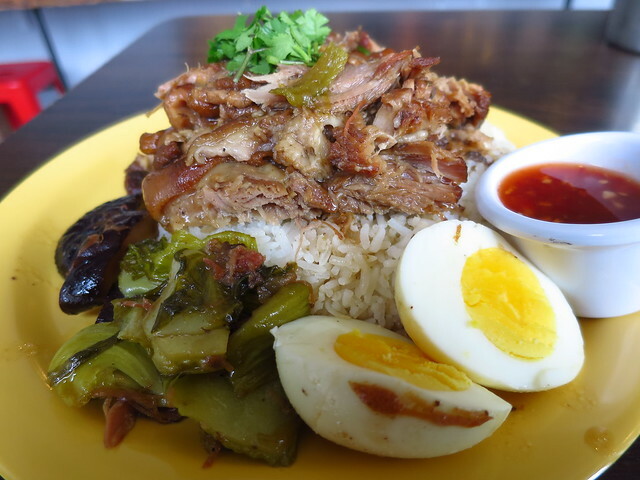 This is a dish somewhat similar to Khao Man Gai except it's pork thats simmered until tender. Pork Shank is cooked in a broth with plenty of Chinese 5 Spice powder. Once tender it's served atop a mountain of rice. It comes with a hard boiled egg on the side and also some greens, mushrooms, and a gnarly cup of red chile sauce. This is a popular street dish in Thailand and said to be the favorite of former Thai Prime Minister Samak Sundaravej who was also a celebrity chef. I think he'd be happy with this version. I know I was. The Hainan Chicken looks about like the others I've had in Chicago. It depresses me to concede that my favorite Thai dish isn't particularly well-executed hereabouts when I'm otherwise a defender of Thai in Chicago as being among the best in the U.S. and particularly strong in light of the limited number of actual Thais here. My hope is that this dish will follow the arc of ramen in Chicago - from marginal, to trendy (but "wrong"), to good, with some established pros landing from abroad as well as locals taking a serious approach. The pork dish looks great, though. Tell me the greens are pickled and I might have to go right now. I work a block from JJ Thai so I've been there several times already. The Tum Khao Phod (corn salad) is absolutely amazing. The last two times I was there, they also had something called Miang Kham as an appetizer. It was a salad of toasted coconut, pineapple, lime, onion and peanut, served with banana leaf(?) wraps and a dipping sauce. So good. Last edited by merkay on March 3rd, 2016, 6:08 pm, edited 1 time in total. Looking forward to getting over there. 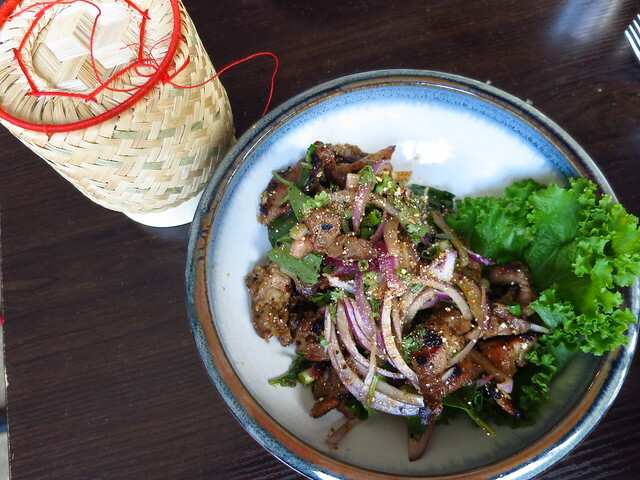 NB: the one-bite salad usually involves betel leaves (like Vietnamese la lat). Banana leaves aren't usually ingested, though they might be trying something new (possibly from the banana blossom, which is eaten?). Also- glad my kid's education brings me to this hood regularly. Veneno, Veloz, Authentaco, Pasada, Pasadita, Barca, Podhalanka, Hoosier. A coupla' decent cheap eat options around that way. I popped in a couple of times when the spot was relatively new, and nothing I had warranted much praise. Unfortunately most of it it came off, as so many new "street food" restaurants do, synonymous with "dumbed-down" and "over priced". Nice surprise to hear Miang Kham on the menu somewhere. I've always enjoyed that as a flavorful bite. Doubt it was banana leaves (quite a chew). I've had it in Thailand and Laos with various whoknowswhat local leaves; the states, mostly lettuce wraps. Laikom, sorry to hear the place was unremarkable. I'll tell you one thing (though it's sacrilege), that I wouldn't mind finding one of these Thai street food places that did a real 15 bhat style late at night where's my hotel kind of phat thai. Something that approximated a night market would be a cool find as well. I'm happy to have this option in the neighborhood. 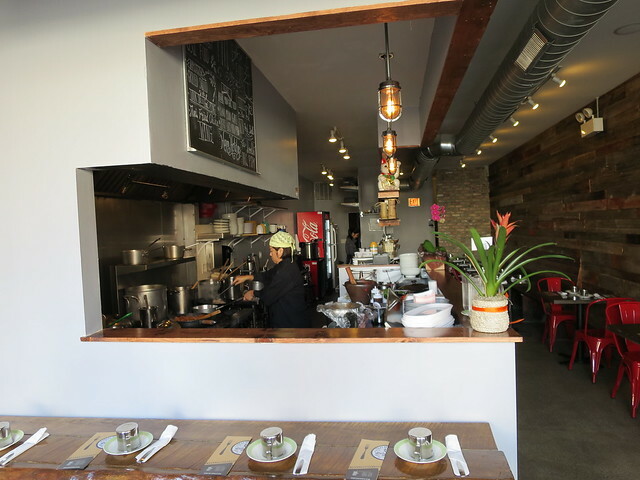 Like Sala Bua, RIP, they offer Thai dishes that you don't typically find south of Belmont, though in my experience are (like that other restaurant) somewhat muted compared to their northern brethren. I like the open kitchen and its a treat watching chef work. I watched her chargrill my pork salad to order on my first stop. The meat had a nice char and was juicy, inherently flavorful of pork, though the dressing was really timid, almost not there. I found the pork with the Khao Kaa Moo to also be very satisfying– tender, sticky, and porky and unapologetic with its awesome jiggly fat. At least for take out, the proportions were a bit odd. There was one forkful of pickled greens. And I got what seemed to be a blend of two rices: unadorned Jasmine and then wet, porky rice (that might have been a result of the meat juices sloshing around in its container.) And the too-small container of hot sauce seemed to be out-of-the-jar sambal and was no more exciting. I'm sure I'll be back, the food is made fresh with seemingly quality ingredients. I think the value is fine for the neighborhood too. I'll just have to dose it with my own chiles and fish sauce next time. laikom wrote: I popped in a couple of times when the spot was relatively new, and nothing I had warranted much praise. Unfortunately most of it it came off, as so many new "street food" restaurants do, synonymous with "dumbed-down" and "over priced". I, too, was disappointed with the inaccessibility of the menu pricing, especially for solo dining - if you want two contrasting dishes there is no way to do it sub-$20, and the dishes vary from really small to a small bathtub of sodden rice (the khao kha moo) without explanation. Recommended sticky rice add-on (not included) for some dishes is a bummer. I was also not impressed with the food across the board. The tom yum was downright bad, including inedibly hard and indifferently cleaned lemongrass and galangal. The meat salads did not have the nice grill-caramelization depicted above or at other recent hits. Could have been an off day, but since the pricepoints don't encourage solo visits and the room is not really set up for group dining, I won't find out soon. I miss Sala Bua (whenever else was there a cause to write "a non-fusion Thai place open late on the South Side! "), and so I've ended up at JJ a few times now when I can't make Rainbow or the Western Ave. spots by 10 PM and need some funk. Business always seems to be brisk, and mass-market reviews are surprisingly steady and good. The dish I've settled on is the bamee - a full selection of roasted and pickled and boiled textures and flavors with a side of clear broth, laced well with the condiment caddy including oyster sauce and marinated peppers, and sometimes with a fried egg added. Their rendition is a good example in this town and one of the only sensible pricepoints on the menu relative to many better analogs northward. By the holy light of Dear Sweet Carol Channing's Actual Ghost, these Isaan sausages at JJ were the best of last season for me including Aroy. This place has been gaining steam for me, and I continue to particularly appreciate the always-fresh condiment caddy if not the metal drinking cups. Santander wrote: By the holy light of Dear Sweet Carol Channing's Actual Ghost, these Isaan sausages at JJ were the best of last season for me including Aroy. This place has been gaining steam for me, and I continue to particularly appreciate the always-fresh condiment caddy if not the metal drinking cups. Wow, last time I had these they were mushy rice nuggets, no tang, little seasoning, and hardly any discernible meatiness aside from fat. I'll gladly give them another shot since they're on my weekly path. Thanks for the head's up. I have a superstition that remains utterly upheld by experience with JJ that if I can't sit in at a 2top at the window I won't enjoy my meal. I am generally not a fussy sitter in the least. But somehow- my meals when I sit in their window are always great and if I don't something ends up as slightly to notably off. I won't for one second foist such parameters on any of you (lest you get there before me) but I've come to abide by this. If the window tables are taken then its Veloz for me. All that said- I love JJ's grilled salads and the perpetual special fried chicken larb/ish salad. It took awhile for me to find my stride here but this has come to be one of my favorite weeknight indulgences. Condiment caddy is key. 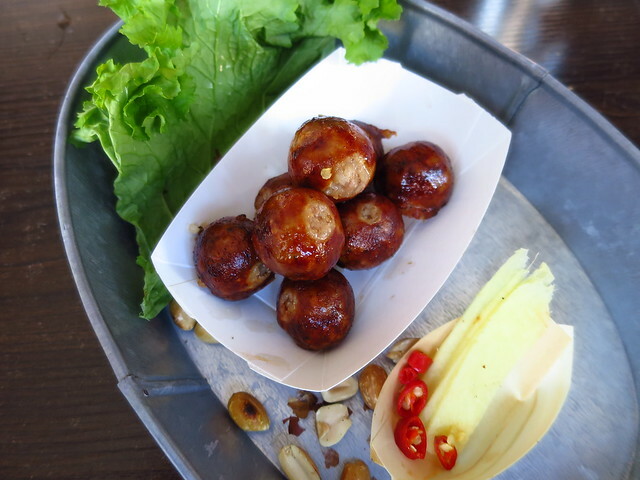 Santander wrote: By the holy light of Dear Sweet Carol Channing's Actual Ghost, these Isaan sausages at JJ were the best of last season for me including Aroy. If Dear Sweet Carol Channing's ghost shines her blessed light on JJ's sausage I should stop and see if they really are "Dy-no-mite!" MunicipalTruckin wrote: All that said- I love JJ's grilled salads and the perpetual special fried chicken larb/ish salad. It took awhile for me to find my stride here but this has come to be one of my favorite weeknight indulgences. Condiment caddy is key. That's exactly the thing to get. The beef curry is also fine in my book - sometimes I have a fried egg added to that. I should mention on the sai krok e-sarn it's very much the moist fattiness that I dig - the sour and garlic really carry through (if the other flavors are subtle) and it's never dry. It reminds me of the first time I had it at Spoon. I had lunch here today and I concur that the Sai krok Isan is contender-worthy. Sticky on the outside with a good snap, moist on the interior with just right tang and garlic, a much different & improved animal than my first try a few years back. The fried chicken salad was great too, dig the skin & gnarly bits left on the all dark chicken chunks. Beef curry, though, pretty sad. Grey beef in a two-can effort sauce. Fwiw, we sat in the window seat! Glad there's at least a few worthy Isan/northern-ish dishes in walking distance from work. Finally made it last night. It's been on my radar since they opened, especially since very close to home, but just never worked. We started with Som Tum, really good heat, but the weakest dish of the night, and I love Som Tum. We also ordered the three vegetarian items on the menu, tofu salad (great light, but crispy tofu. could have used more greens or vegetables), basil tofu with rice (really good flavor, but my wife felt it could have had a bit more sauce, especially for the Jasmine rice), and the egg noodles with crispy tofu (my favorite item of the night). While we really loved these dishes, perfectly cooked and nice presentation, just wish there were move vegetables, basically tofu, rice, or noodles. Nice space and appreciate the BYO. Found an 08 Belle Pente 'Murto Vineyard' Pinot that was a couple years past it's peak, buried in my bottles. Almost forgot to plug The Artistic Home Theater on Grand. We went to see Rod Serling's 'Requiem For A Heavyweight' after dinner. We see a lot of theater, mainly from small companies, and the productions at The Artistic Home are always excellent. This season they're on a roll. Really enjoyed last fall's Rock 'N' Roll, by Tom Stoppard and the staff was really high on next production, 'Ada And The Engine'. We live in a world class theater city and need to support them. Last night it looked like 40 seats and there were a few open on a Saturday evening.